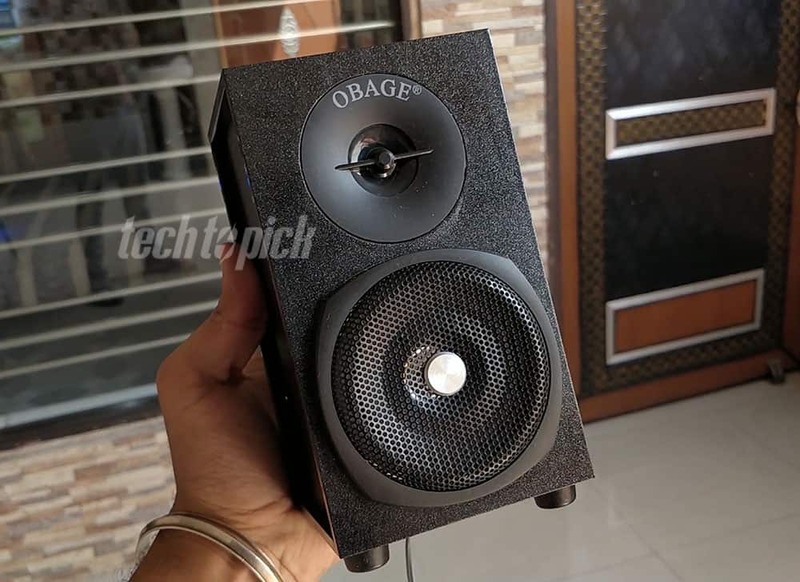 There are a lot of Speaker brands available in India but there are only a few brands who actually made their speakers in India and Obage is one of those brands. I’m testing Obage OE 101 Multimedia Speakers from almost a week now and today I’m going to share my experience with you guys. So, Obage OE 101 4.1 Multimedia Speakers are available in India via Amazon Exclusive but now the company is growing and trying to establish their offline market too so, soon you may find Obage speakers in your local market. But Until that happen you can buy Obage OE 101 from Amazon.in for Rs. 3,850. First of all, Obage really take care of packaging the system we received at our office is in perfect condition and Inside the Box, we got 4 Speakers, 1 Main Sub-Woofer, 1 Remote Control with cells, AUX Cable, User Manual, Warranty Card, and Thankyou Letter. Obage OE 101 is one of those few 4.1 speakers available in the market under 4000 INR which comes with a fully closed wooden subwoofer. There is a shiny paper on top to give it an attractive look but I’m not sure how durable that is. Talking about speakers they also made from wood like material and trust me quality is quite solid and speaker & subwoofer never move an inch even at full volume. Speakers come with legs to protect speakers from the surface. But frankly speaking, I don’t like the control center much it’s not very attractive and even quality seems bit low here but you can’t expect too much under Rs. 4000 Overall I can say its acceptable. The remote comes with this set is also very nice and build quality is also very solid and offer almost all the controls at one place. So, In Build Quality overall I like to give 9.5 out of 10. 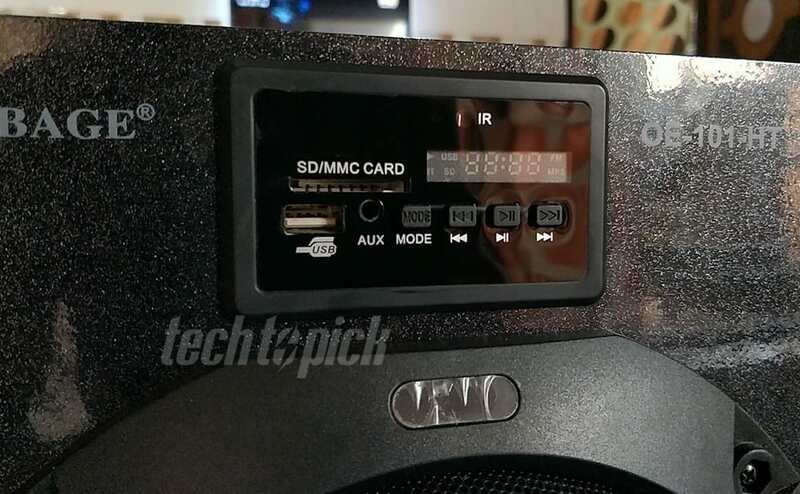 There are a lot of good looking speakers available in the market with attractive looking subwoofer with multicolor led lights on top. But when it comes to performance they will disappoint you. But here is a different story Obage OE 101 looks good and modern (but doesn’t have LED Lights) and when it comes to performance they just nailed it. I personally haven’t heard this much good sound quality in this price range. You can easily find louder speakers the Obage OE 101 but if you are really looking for Sound Quality then it’s hard to find similar to this under Rs. 4000. The Total output of Obage OE 101 is 65W (45W Subwoofer + 4 X 5W Speakers). But still, it’s not loud enough they work on sound quality much then loudness. It’s perfect for 10X10 rooms or even 12X12 room if you want to fill the room with bass. Bass goes down to 40Hz which is very difficult for speakers in this price range. That’s why you got really deep bass. You can listen to music on Obage 101 for a long time without hurting your ears and all the instruments in background music are clearly audible doesn’t mix up with bass which I really like. This is great for those who want clarity, melody, balance, and smoothness of sound. Vocals are very natural and clear. Bass is very deep and dominant. This system has very low Distortion, very less noise and super clear. It is not meant for loud listeners. 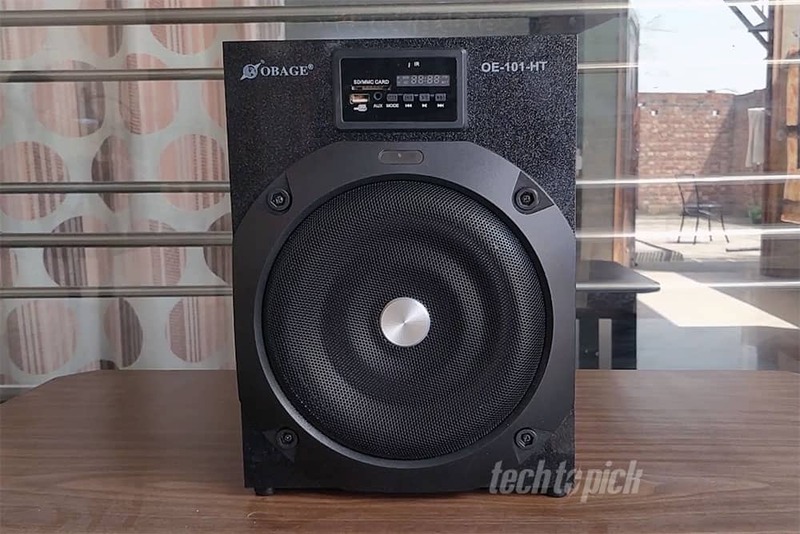 If you are looking for high output speakers, go for any other system like Obage OE-301 which we reviewed previously. Overall in Sound Quality, I like to give then almost 10 out of 10. Connectivity options are very important in a music system because everyone has different need and different usage. Obage OE 101 has almost all the connectivity option like You have SD Card Slot, AUX Input, USB Port, Bluetooth. So, basically, you can connect these speakers to any device without any problem. But sadly there is no NFC Option which is not like very popular in India by the way. Overall I’m happy with the connectivity option and like to give 8.5 Out of 10. 1. Super Solid Build Quality. 2. Really Deep bass and doesn’t mix up with lyrics. 3. Very clear audio at a really budget-friendly price. Technically there is no con in this speakers but if they can add some led lights in this that would be cool. If you are looking for Sound Quality plus loudness doesn’t matter much and you like to listen music for quite a long time then Obage OE 101 is the best option for you below 4000 INR.